Lucien Kubo, Japanese American Internment (2005). Mixed media assemblage (acrylic, found papers and images of Topaz barrack and aerial, Dorothea Lange photograph of two children waiting to be interned, encaustic, found metal from Heart Mountain, wood) 18” x 18” x 4”. © 2005 by Lucien Kubo. Lucien Kubo’s work appeared on the Winter 2014 issue of Signs. I am a Sansei, a third-generation Japanese American. An important part of my life experience is that of my parents, their family, and over 120,000 Japanese Americans incarcerated in internment camps during World War II. I think of my art as philosophical, historical, and personal narratives. I am sorting out how I feel about humanity and the world around me. I want my artwork to engage the viewer, create some type of dialogue, create pause for thought and possible action. Other works question nuclear war and power (Hiroshima/Nagasaki and Fukushima), environment, immigration, racism, identity, and the celebration of one’s culture. 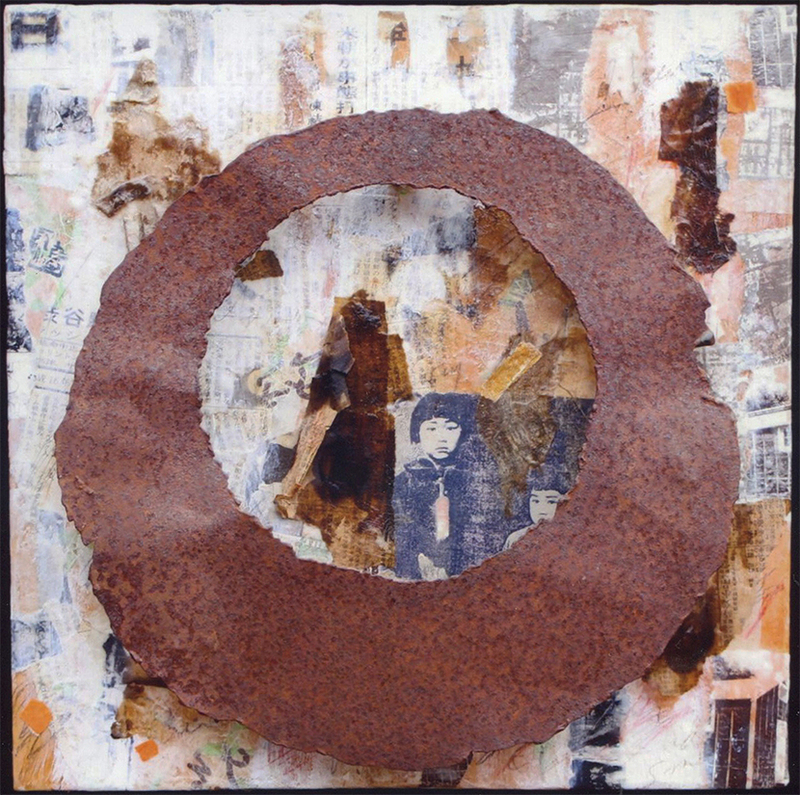 I work with a wide range of materials, including recycled and found materials, various papers, paint, and encaustics to create collage and assemblage. Lucien Kubo is a third-generation Japanese American who grew up in the San Francisco Bay Area. During the sixties and seventies, she began her involvement in the social and political issues of the day. The civil rights movement, opposition to the Vietnam War, support for immigrant rights and women’s rights, redress and reparations were just some of these. Inspired by the changing times, she became involved in both the San Francisco and Los Angeles Japanese communities. She worked with residents concerned with the future of Nihonmachi and urban renewal. She became aware of the common concerns all people have for human rights, at home and in the global community. Years later, many of these experiences have inspired and become an integral part of her artwork. She creates art exhibits in the San Francisco Bay Area and in Santa Cruz and has curated exhibitions encouraging social change. She is a member of the Asian American Woman Artists Association. She lives in Soquel, California.